Most visa applicants, including children, are required to pay a Machine Readable Visa (MRV) application fee, whether a visa is issued or not. The visa application fee is determined by the type of visa for which you wish to apply. The MRV fee is non-refundable and non-transferable. You must confirm whether or not the fee is required before you pay. A or G visa applicants going to the United States on diplomatic or official travel. J visa applicants participating in a U.S. Government-sponsored program. For more information about fee exemptions, please visit this page. Holders of valid visas for the intended purpose of travel. Citizens of Canada or Bermuda (unless applying for an A, E, G, K or V visa category). Nationals of a Visa Waiver Program participating country traveling to the United States for business or tourism for 90 days or less. Remember: Even though nonimmigrant visa fees are valid for one year from the date of payment, the number of times an applicant can schedule an appointment with a single fee receipt is limited. Please plan accordingly so that you are not required to pay another visa application fee. Visa application fees are non-refundable and non-transferable. Depending on your citizenship and the type of visa you are applying for, you may also have to pay a visa issuance or “reciprocity” fee. This fee is not an MRV Fee and cannot be used to schedule an appointment. Please make sure that you pay the reciprocity fee in advance only if you are renewing your previous and submitting your application through interview waiver channel. If you are scheduling your interview appointment, do not pay the reciprocity fee in advance; the fee should be paid at the time of your interview at the Consular Section of US Embassy/Consulate General. In Vietnam you may pay your Visa Fee in person at any branch of Vietnam Post. You must first register on the applicant site and choose the ‘schedule your appointment’ option to access the payment option details. See below for the steps. Log-in to our online applicant system and create a profile. This will ensure the proper amount is paid and activated in timely manner. Values are shown in U.S. Dollars (USD); however the fee payable is in Vietnamese Dong (VND) if you are making the payment in Vietnam. This page has more information about the different visa application fees. Once you are on the Payment screen, click on Payment Options. 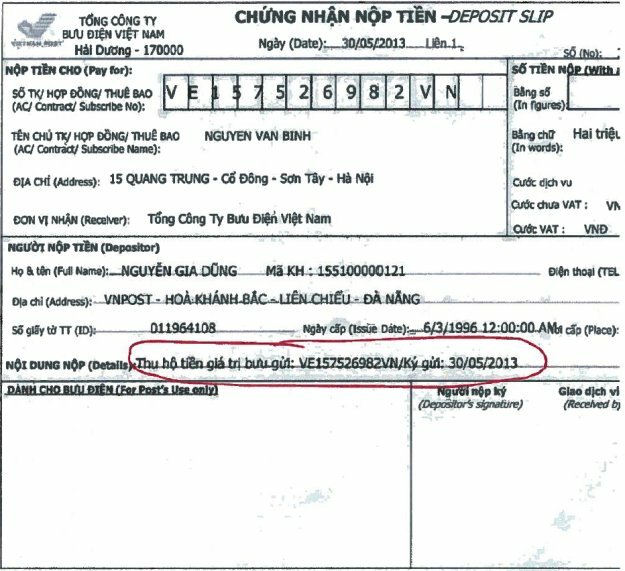 You will print your CGI Deposit slip to take to a Vietnam Post location. DO NOT PRINT MULTIPLE COPIES OF THE DEPOSIT SLIP. If you are applying for multiple visas for your family or group, only ONE payment is required. The VND amounts are based on the consular currency exchange rate determined by the U.S. Department of State. Applicants who do not pay the correct fee for their visa type may be restricted from scheduling an interview. Visit a Vietnam Post to pay your visa fee. When you pay the visa fee, you acknowledge that this is a non-refundable visa application processing fee required as a prerequisite to the processing of an application. It does not indicate the existence of a contract with the applicant, nor does it guarantee a successful application. There is no refund possible regardless of the outcome of this application. After you have paid the visa application fee save Vietnam Post Cashier receipt for your records. It cannot be replaced if it is lost. You will not be able to schedule an appointment without your CGI Reference number. Once you pay your visa fee, you can schedule your interview at 1100am the following business day. Log-in to your profile and complete the Schedule Your Appointment steps with your receipt number. You can pay your nonimmigrant visa (NIV) application fee in cash at any of branch of Vietnam Post. Before going to the payment location, you must print and carry the applicable U.S. visa fee collection slip available after logging into your profile. DO NOT PRINT MULTIPLE COPIES OF THE DEPOSIT SLIP. If you are applying for multiple visas for your family or group, only ONE payment is required. Only ONE CGI Deposit Slip is required. Take the printed deposit slip with you to pay your fee. Be sure that you pay the exact amount indicated on the deposit slip. After receiving your payment, the Vietnam Post cashier will give you a receipt. Save your receipt with the CGI Reference number. It cannot be replaced if it is lost. You will not be able to schedule an appointment without your CGI Reference number. Whether you schedule your appointment online or contact our call center, you will need the CGI Reference Number from your printed deposit slip. Pay before 5pm local time 11am local time the next business day. Pay after 5pm local time 11am local time on the following business day + 1 (2 days after payment).